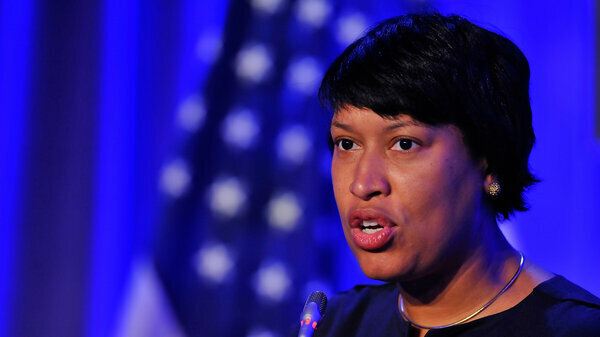 Washington, D.C., Mayor Muriel Bowser last month. In the nation&apos;s capital, FreshPAC&apos;s treasurer, Ben Soto, said in an email that the group had become "too much of a distraction for the mayor." Founded by supporters of the Democratic mayor, the group took advantage of a little-known campaign-finance law that allows PACs to raise unrestricted donations in nonelection years. But the group quickly came under heavy scrutiny for hauling in big donations from individuals and companies that do business with the city. WAMU documented that a dozen donors to FreshPAC were tied to more than $70 million in city contracts. Unlike their counterparts on the national level, local superPACs and outside groups like FreshPAC aren&apos;t being funded by wealthy donors with an ideological bent. Instead, the big-spending political committees are often funded by interests who do business with the city government. Moreover, large sums of money spent in local races can often tip the scales more than money spent on national races. It&apos;s something cropping up across the country with similar outside spending groups that have been active this year from Philadelphia andNew York City to Chicago and Nashville. "One concern is that they are a way for people and companies that are seeking special benefits from the city government to get around campaign-finance limits and, therefore, get more access and influence," said Robert Weschler, the director of research for City Ethics, a nonprofit that advises municipalities on ethics laws. The appearance of pay-to-play politics isn&apos;t new to D.C. politics. In fact, FreshPAC&apos;s name is a riff on Bowser&apos;s campaign pledge to give Washington a "Fresh Start" after the campaign scandals of former Mayor Vincent Gray. FreshPAC quickly raised nearly $350,000. Organizers said they hoped to raise at least $1 million and would likely spend the money during next year&apos;s D.C. Council races to elect candidates who support the mayor&apos;s agenda. Other contributors were promoted to powerful boards and commissions. And some are currently traveling with the mayor in China. The emergence of locally focused superPACs has long been a fear of campaign-finance watchdogs. "There is a more direct relationship between contractors and developers at the local level than there is between organizations seeking policy changes at the national level," Wechsler said. "And a much higher percentage of what happens at the local level involves these contracts, developments, grants, licenses — there are so many ways in which local governments hand out benefits." There&apos;s little jurisdictions can do to block superPACs from injecting large sums of money into local elections due to the 2010 Citizens United U.S. Supreme Court decision. That allowed businesses, corporations and unions to give unlimited money to these political organizations, boosting outside groups&apos; role in elections, said Rick Hasen, a law professor at the University of California, Irvine. "I think that those with business before city councils and local governments are going to get more involved in these independent-expenditure campaigns," Hasen said, "and they are going to have major influence over both who is elected as well as well as what policies are favored or opposed by these local government." Even cities and states that have pay-to-play laws — which prohibit government contractors from making donations — wouldn&apos;t apply to these outside groups. While the law may permit such groups&apos; influence in political campaigns, public pressure may force some politicians to disavow superPACs, like what happened in D.C. While Bowser initially defended the PAC, public pressure soon began to turn against the group. Last month, a majority of City Council members co-sponsored a bill to close the fundraising loophole. Soto disputes any notion that donors to FreshPAC expected anything in return for their contributions or that Mayor Bowser "even entertained such a thought."